> Blog> Weber BBQ Product Reviews & Demos>What is the Weber Gourmet BBQ System? One system - countless possibilities. The Weber Gourmet BBQ System consists of a cooking grate and eight different inserts, which are available separately. The cooking grate can be used in the conventional way, but also has a removable section in the middle. 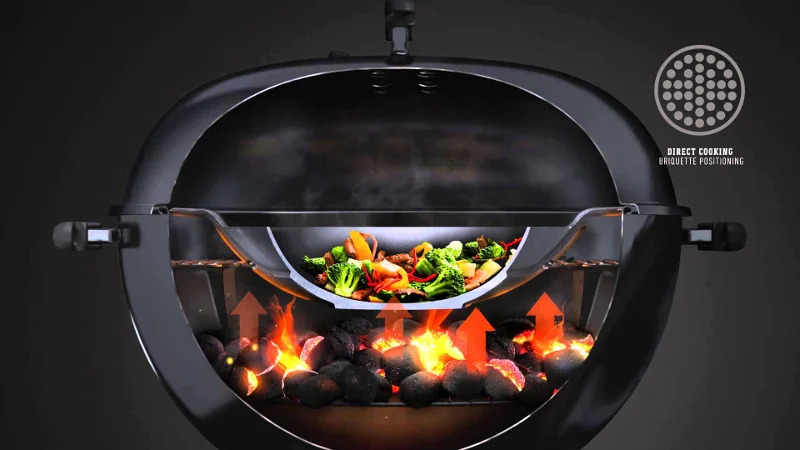 When you take this round section out, you can fit the particular insert you need in the hole: the Sear Grate, Griddle, Korean Barbecue Insert, Ebelskiver pan, Pizza Stone, Poultry Roaster, Waffle/Sandwich Iron, Wok or Dutch oven. This allows the insert to sit slightly lower than the cooking grate, so it is closer to the heat. Combined with the porcelain-enamel cast iron used for all the inserts apart from the poultry roaster and the pizza stone, this ensures that the GBS inserts get piping hot – perfect when it comes to stir- frying, for example. The cooking grate is available for Weber’s 57 cm kettle grill and all Weber’s large gas barbecue ranges: the Spirit, Genesis and Summit. Ideal for grilling big, delicious steaks or pork chops, for example, as it adds amazing grill marks, which are pretty much synonymous with grilling. The Weber Gourmet Sear Grate captures and retains the moisture and juices in whatever meat you cook. A frying pan is every bit as indispensable when you are grilling as in the kitchen. The Weber Gourmet Cast Iron Griddle allows you to cook things that cannot be done on the grate, e.g. shrimps, meatballs, mushrooms, scrambled eggs or even pancakes. This pan enables you to sample ebelskivers, which are a kind of Danish pancake – just small and round. You can also experiment with savoury ebelskivers, meatballs, drop scones, soufflés or even small omelettes. Breakfast, lunch and dinner, Weber's Waffle and Sandwich Iron can be used for any meal of the day. The new Weber accessory with help you prepare sublime waffles, sandwiches and even toast. Allows you to do traditional Korean barbecue, which involves thin slices of marinated meat. First of all the cast iron gets extremely hot and secondly, as the leftover marinade disappears through the holes, the meat grills instantly. A classic, the Weber Dutch Oven solid pot that enables you to prepare all sorts of intense, slow-cooked meals on the grill, such as chillies, stews, soups etc. The pot will slowly release its heat from all sides, allowing the food to simmer. It is perfect for baking bread too. Make pizzas like the Italians – this cordierite stone gives you a really hot surface on which to bake your pizza, guaranteeing the perfect crust we all dream of. And the rack makes the stone easy to carry to and from the barbecue. A truly versatile piece of equipment! The shape and cast iron composition mean that the Weber Wok gets piping hot, so you can use it for all sorts of quick Asian dishes like vegetable stir-fries, curries or fried noodles. Or you could try making soups, stews or French fries in it, for example – the possibilities are endless. Fill the bottom of the roaster with your favourite vegetables, pour beer, wine or maybe cider in the middle and place a whole chicken on top – then get ready to enjoy the juiciest chicken ever! The insert can also be used for baking cakes. Beer can chicken at its best.